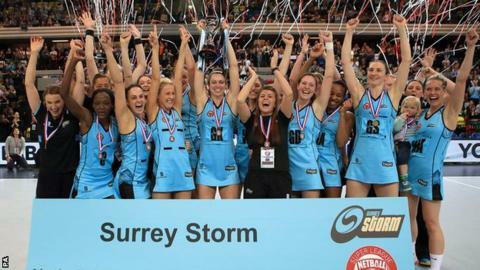 Surrey Storm will start their Superleague title defence against Team Bath, as all eight franchises open the season on 30 January at the National Exhibition Centre in Birmingham. It will be the first time the opening round of four fixtures has been held at one venue on the same day. Hertfordshire Mavericks start the event against Celtic Dragons, before Yorkshire Jets play Loughborough. Manchester Thunder will face Team Northumbria before Storm take on Bath. Surrey claimed the title for the first time in their history by beating the Mavericks 56-39 at London's Copperbox Arena in April. As last season, there will be 14 rounds of fixtures, played out over 12 weeks, with the 2016 grand final on 7 May.